Stark yellow hills surround a fodder camp at Salse village in Maharashtra’s Solapur district. In the afternoon heat, cattle desultorily munch on hard chunks of sugarcane, while farmers doze in nooks of shade. The picture of drought is dismal. But the lush green banana plantation barely 500 feet away is puzzling. “Maybe that farmer has a borewell,” says farmer Motiram Gadge. “Many powerful people here are growing banana and sugarcane despite the drought.” Gadge’s animals walk 14 kilometres every day to a fast-drying dam to drink water. On the face of it, the severe drought defies explanation. The drought-affected area received 60 to 70 per cent rainfall this year against the state average of 90 to 92 per cent. This is deficient but not deficient enough to cause drought of this magnitude. Fourteen districts in Marathwada, Khandesh and south Maharashtra have been declared drought-hit. More than 11,000 villages are facing water crisis and 3,905 villages have suffered more than 50 per cent crop loss. Comparing this year’s drought to that in 1972, the most severe in recent history, Bharat Patankar, a senior drought mitigation and dam displacement activist, says the rich and the poor alike were forced to migrate in 1972. This time the landscape shows alternate patches of acute scarcity and abundance. Water-intensive cane and banana crops stand cheek-by-jowl with withered jowar seedlings. The failure of the rainfed jowar crop has caused a severe fodder crisis, but unlike 1972, sugarcane has not just survived but is in excess, and being fed to animals as fodder. Unlike in 1972, the current drought is characterised by a severe drinking water crisis, both for humans and cattle. Significantly, villages with highest acreage of sugarcane are also the worse hit by drinking water crisis. It is still many months before water-starved Maharashtra gets rainfall. But government officials say the situation is comfortable. “The state government has already invested Rs 2,000 crore in relief measures,” says Milind Mhaiskar, state secretary for relief and rehabilitation. “As many as 1,700 piped water projects are being set up in urban and rural areas to ensure drinking water. Fodder camps are also being set up. Another Rs 1,000 crore has been sanctioned for the remaining summer months,” he says. But the situation does not seem so hunky-dory. As per government’s plan water for the new projects will be sourced from Jayakwadi and Ujni dams, which are already asking for water. Besides, if all is well, why did Deputy Chief Minister Ajit Pawar announce that Maharashtra will buy water from Almatti dam in Karnataka to meet its drinking water requirement? Negotiations are on for this, Chief Minister Prithviraj Chavan had said on March 2. On March 10, government instructed the Mumbai police prepare itself for a water-related conflict. Like many other farmers, Rahul Kargode of Pali village in Beed district pays Rs 200 for 500 litres of drinking water to private tanker owners every second or third day. He uses the water to save his standing sugarcane crop. But his new sugarcane crop has withered. The borewell he had installed a few years ago has gone dry. In Pathrud village of Osmanabad district, Taramati Wadke, who runs a small eatery, shells out Rs 300 daily for 800 litres of tanker water. “The price has doubled since November. If it increases further I don’t know how I will pay,” she says. This apart, unethical water consumption continues unabated even in the face of drought. While Aurangabad, Solapur and Beed districts reel from drinking water crisis, unscrupulous use of water in golf courses, water parks and swimming pools is rising every day. Parli thermal power plant in Beed was shut down in February due to water crisis, even as breweries and distilleries in Aurangabad flourish. The biggest paradox, however, is that the drought has hit a state that has the largest network of dams in the country. Thirty-six per cent of the country’s dams are in Maharashtra. But politically and financially powerful groups almost always grab the lion’s share of water. Conflicts exist between water users upstream and downstream, industry and agriculture, urban and rural users and even village-level political groups. According to the Maharashtra Water Resources Regulatory Authority (MWRRA) Act, 2005, there should be equal distribution of water to all projects in a river basin during water crisis. In November 2012, water in Jayakwadi dam, on the Godavari river in Aurangabad, dropped to two per cent of its storage capacity of 107 thousand million cubic feet (tmc). But upstream dams in Pune and Nashik regions, which were 81 to 92 per cent full, did not release water. Jayakwadi dam supplies water to four cities, 200 villages, the 1,130-megawatt Parli power plant in Beed, and the Maharashtra Industrial Development Corporations (MIDCs) in five districts. While Jayakwadi dam had less water for use, Ujni dam in southern Maharashtra, the third largest in Maharashtra, had not water that could be used. Again, upstream dams did not release water. Ujni provides water to Solapur town and about 40 villages. Angry farmers and civil society groups launched a fierce agitation, asking for release of water even as they faced stiff resistance from political and farmers’ groups upstream. On November 27, Chief Minister Prithviraj Chavan asked for release of water to Jayakwadi. A total of 8.5 tmc was released from four dams, that too under heavy police protection. “The resistance is shocking. The water was not for industry or agriculture. It was for drinking,” says Vijay Diwan of non-profit Nisarga Mitra Mandal in Aurangabad. Ujni dam has not got water yet. The conflict is likely to intensify as summer progresses, says Diwan. The contenders upstream are the industrially advanced Pune and Pimpri-Chinchwad cities, while downstream it is the powerful sugar lobby. “Jayakwadi and Ujni were constructed to meet the water needs of people living near this arid region. 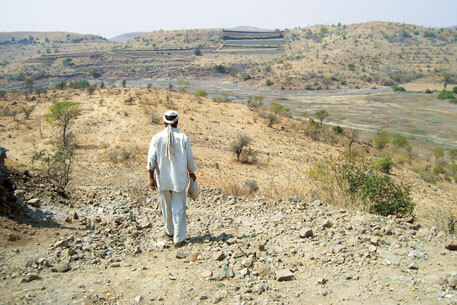 Later, projects were sanctioned upstream, which diverted water to the water-rich parts of Pune and Nasik,” says Diwan. In the past 10 years, Jayakwadi has not filled up to its capacity. The conflict has defeated the purpose for which the two dams were built, he says. The fight is because of the legal mess in water governance, says Pradeep Purandare, former professor at the Water and Land Management Institute, Aurangabad. According to the Maharashtra Irrigation Act (MIA) of 1976, all irrigation projects and their command areas should be notified under it. Thirty-seven years later, the Act has not been implemented because their rules have not been framed. “The irrigation department does not have the power to take action and prevent water diversions from agricultural land for non-agricultural purposes like industry,” he says. To complicate matters, in 2005 two water sector reform legislations—MWRRA Act and Management of Irrigation Systems by Farmers Act—were passed on the premise that MIA 1976 is brought into force. Besides, two water governance bodies were constituted—State Water Board and State Water Authority—to prepare Integrated State Water Plan. Neither has held a meeting in the past eight years. Even basic governance is difficult in absence of infrastructure, prescribed procedures for measuring water use, irrigated area, evaporation, siltation, conveyance loss and theft. But Pramod Mandade, state deputy secretary denies absence of a working mechanism. “Too precise mechanisms were not needed when there was ample water,” he says (see ‘All set for the summer?’). With no clear reference point for governance, malpractices have become easy, says Purandare. “The process of sanctioning projects is in the hands of unscrupulous politicians,” he alleges. Ghoti, a village in the severely drought-hit Solapur district, is facing accute drinking water crisis. It also has the dubious distinction of having 6,000 borewells for its 3,000-odd residents and about 40 hectares (ha) of standing sugarcane crop. Till about 15 years ago the village had no water worries. Things changed after two sugar factories were set up in the neighbouring Karmala and Barshi tehsils. Farmers started growing sugarcane in large tracts of land. Water that came from Ujni dam was enough for irrigation. But when monsoons failed in 2011 and 2012, they started drilling borewells in desperate bids to save their crops. Balasaheb Raut, who owns 2.4 ha in the village, has drilled six borewells. In Latur district, 150 borewells are drilled every day. Water, that was once available four metres below ground, has plummetted to about 200 metres. Yet, six per cent of the state’s cultivated area is occupied by the water-guzzling sugarcane. 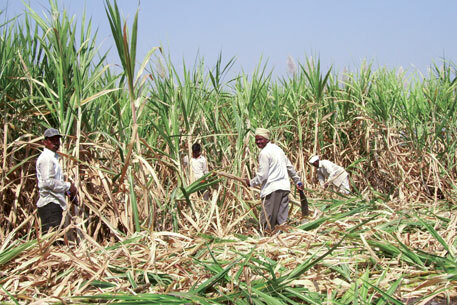 One hectare of sugarcane ensures that at least four hectares of other crops are deprived of water. “Its water footprint is alarming,” says D M More, former director general of the state government’s water resource department. “At present, sugarcane alone consumes water equivalent to the total storage capacity of all dams in Maharashtra,” he says. More runs non-profit Maharashtra Sinchan Sahayog and has done a two-year study on the impact of sugarcane crop in the state. Excessive digging of borewells is drying up acquifers. Villages that have standing sugarcane crops are most likely the ones which are buying drinking water from private tanker owners, he says. “There is a growing feeling among people that they are being deprived of their rightful share of drinking water even as others’ crop flourish,” says Madhav Chitale, head of the Maharashtra Water and Irrigation Commission, 1999. But the government has ignored all such recommendations. Chitale admits that sugarcane has damaged the region’s agro-economy, fuelled drought and caused water-strife but does not say why the recommendations were ignored. Umakant Dangat, state agriculture commissioner, blames sugarcane for the drought but says agriculture department is helpless because its jurisdiction is limited to recommending drips and sprinklers for water conservation. The reason for this conspiracy of silence is the political clout sugar cooperatives wield. Almost all sugar factories in the state are controlled by powerful politicians. Thirteen of the 30 ministers in the state Cabinet are either sugar factory owners or heads of sugar cooperatives. Policy measures are, therefore, dictated by the sugar lobby. 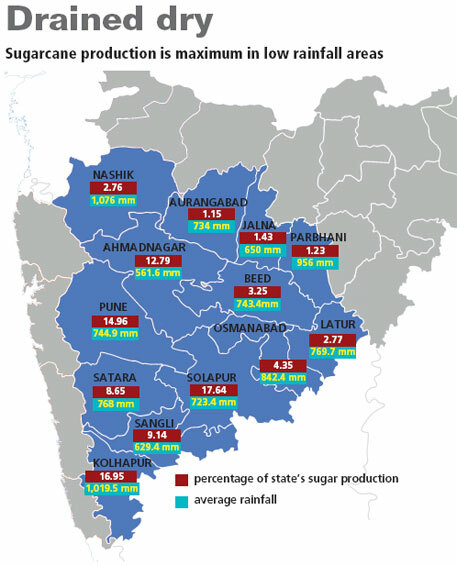 “When proposals for dams are prepared, sugar factories are not mentioned, though 90 per cent of irrigation water is monopolised by sugarcane cultivation and sugar processing units,” says Dwarkanath Lohia, member of State Water Conservation Advisory Council. The number of sugar factories in the state has increased from 119 in 1999 to 200. Proposals to set up more factories in water-deficit areas are being considered by the Central government. Since most of the sugar from Maharashtra is exported, Solapur collector K M Nagzode had proposed that crushing of sugarcane should be suspended this year. Crushing one tonne of sugarcane takes up 400 litres of water. The proposal was shot down by politicians. “Politics here is controlled entirely by the sugar lobby, right from the village level,” says Bhise. “Politicians determine who will be the sarpanch, who will get big contracts and who will get irrigation water. This year, they have grabbed contracts for running fodder camps, which should logically go to milk cooperatives,” he says. The state government proposes to remedy the situation by converting all sugarcane cultivation from flood to drip irrigation within three years. Union Agriculture Minister Sharad Pawar has announced Rs 1,000 crore for the purpose. According to More, drip irrigation is significant to prevent drought. However, he warns, the change will work only if the number of sugar factories are reduced and sugarcane acreage is redistributed rationally in the state. A major share should go to high rainfall Konkan and eastern Vidarbha regions where jaggery-making was traditionally practised, he says. Twenty-two years ago, Suresh Desai designed a mulch-based sugarcane farming technique that reduced the crop’s water requirement. He reduced the irrigation channels in his farm by half and converted every alternate channel into beds of mulch using waste sugarcane straw. This brought down the crop’s water consumption. Within three months, the soil structure improved and he was able to reduce the number of channels further, applying water to just two channels for six rows of sugarcane. He also started intercropping legumes with cane. Desai, who now heads the Organic Farmers Club in Belgaum, Karnataka, says the technique is more effective than drip irrigation as it not only saves water and improves soil fertility, but also needs no external inputs. “An upper limit for sugarcane acreage should be set for each farming family. At present, rich farmers have monopolised both sugarcane and irrigation,” says Lohia. “Farmers who shift to drip irrigation save money and use it to extend their sugarcane acreage,” says Lohia. The State Economic Survey for 2011-12 reveals that subsidy worth Rs 1,134.82 crore has been provided for installation of drips and sprinklers on 612,000 ha since 2005. It has not increased the irrigated area. Farmers say that in a situation as severe as the current drought, drips do not work. In 2012, Savita and Malhari Deshmukh of Pisore village in Ahmadnagar invested Rs 1.25 lakh to convert their 2.5-ha lemon and sweetlime orchards to drip irrigation. But their crops still do not get enough water. “We were banking on water from Kukkadi canal. Without it, the drip is wasted investment,” says Malhari. Organic farmers say drip farming requires huge investments and maintenance (see ‘Sustainable alternative’). Besides, drip sets need to be replaced every few years. Many companies have taken water conservation measures, but is it enough? Threat of a bigger crisis in the next few months has pushed industry to adopt water conservation measures. “Unavailability of water cannot be an issue that should affect production. Treating and using recycled water is possible,” says Sushil Haksar, director general of Association of Distillers, Brewers and Vintners of India. Since the Maharashtra Industrial Development Corporation has made substantial cuts in water supply, “the focus has shifted to conservation, monitoring wastage and recycling,” says Sunil Raithatha, president of Chamber of Marathwada Industries and Agriculture. “Our members have reduced water consumption by 40-50 per cent,” he says. Vidarbha recieved average rainfall this year. But crisis in the next few years seems imminent considering the number of projects planned along the rivers in the state, says Sudhir Paliwal, joint secretary of Vidarbha Industries Association and convener of Vidarbha Environment Action Group. As many as 140 thermal plants with a collective capacity of 55,000 MW have been planned for the region. “In Chandrapur district alone, 27 new plants are proposed along the Wardha,” says Yogiraj Doodhpachare, environment scientist at Janata Mahavidyalaya in Chandrapur. Till date, power plants in Vidarbha have received a whopping 2,049 million cubic metre (mcm) from irrigation projects in the region. The state’s largest thermal plant, the 2,340-MW Chandrapur Super Thermal Power Station, may face problems as its two new units will get operational by year- end, says Doodhpachare. Industrial water demand in Vidarbha is likely to rise too. In February, Chief Minister Prithviraj Chavan announced many textile and cement units in the region. Maharashtra has a history of having skewed priorities. In its water policy, the state gave priority to industry over agriculture in making allocations in 2003. It was only in 2011 that agriculture was restored as the second priority after drinking water. A study by Pune-based non-profit Prayas reveals the total volume of diversions since the inception of dam projects till 2010 in the state was 2,886.15 tmc, a whopping 77 per cent of storage capacity of all irrigation projects in the state. This means 257,000 ha agricultural land is water deprived. Fifty-four per cent of the diverted water has gone to industry. Of the 46 per cent allocated for drinking water, 96 per cent went to urban area and just one per cent was allocated for rural drinking water. Of the water diverted to industry, 61 per cent was for coal-based power plants. Maharashtra Industrial Development Corporation got 21 per cent share, while SEZs have grabbed 16 per cent. The remaining two per cent water has been given to other industries. Jalna-based Rajouri Steels has a 7 metre private dam spread over 10 hectares. It has a 20-metre deep well for recharging groundwater. “Earlier, the dam would easily meet our annual water requirement of 130 million litres. This year, due to scanty rainfall we faced water crisis,” says D B Soni, the company’s managing director. Rajouri Steels is spending Rs 25-30 lakh daily on about 150,000 litres of water supplied by private tankers. Due to the water crisis, production has been hit by at least 25 per cent. To save water, the company has started using only half the power it gets during the day and is operating steel bar manufacturing plant at full power during the nights. Water requirement in the manufacturing process rises during daytime due to evaporation. To maintain moisture in the soil, the company has planted nearly 2,000 trees in its compound. Maharashtra State Power Generation Company Limited has not faced water crisis this year because it has raised the height of Irai dam by one metre to enhance storage. All its new plants have been designed with effluent treatment plants, says Anil Nandanwar, executive director of the power company. He, however, admits that since a large number of thermal plants have been proposed on the Wardha, there might be scarcity in future. As a pecautionary measure all the new plants are designed for zero disposal through installation of effluent treatment plants to recover 100 per cent of the water used for ash disposal, says Nandanwar. The older plants are being upgraded with the installation of effluent treatment plants. Many breweries have reduced their dependence on water tankers by using reverse osmosis (RO) plants. S G Patil, general manager at Radico N V Distilleries Maharashtra limited, claims installation of a Rs 4 crore RO plant has helped cut time and water consumed during the fermentation process. Water recovered from the fermentation process is reused to manufacture extra-nutrient alcohol, or spirit. In mid-February, Atul Singh, chairperson of FICCI Water Mission, said the mission plans to form a water disclosure framework where all industries will give details of the amount of water they use. “Emphasis will be on reduce, recycle and replenish water,” he says. This apart, research is being undertaken to devise a strategy and find innovative solutions to counter the water challenges Maharashtra is facing, he says. A collaborative model is being worked out where the government, industry and civil society will come together. It will be called the Golden Triangle, he says. Only time will tell how effective all these measures will be. Maharashtra is a pioneering state in watershed development. It has conserved, regenerated and judiciously managed its water resources in 12.6 million hectares (ha) of the state’s 24.1 million ha that have 43,000 micro-watersheds. Development work has been done in 42 per cent of Marathwada region, the worst affected by drought. Umakant Dangat, state agriculture commissioner, says Rs 60,000 crore has been spent on watershed development in the past 10 years. But these are all government data. Ground reality is quite different. Water-starved, poverty-stricken and migration-prone Gourwadi village in Beed district shows how the state government has failed in watershed development work despite making huge expenditures. Gourwadi has two tanks to meet its water requirements. The first is a five-minute walk from where people live, and the second is 200 metres down a steep, dangerous slope. People take the difficult 2.5-km track to fetch drinking water from the second tank because the first one is damaged and has been empty for years. “We have been asking government officials to repair the damaged tank so that drinking water is closeby, and for a mechanism to irrigate farms from the second tank,” says former panchayat member Aba Dadarao Gadge. But in January this year, the agriculture department began work to set up a drinking water pipeline at the second tank instead of repairing the damaged tank. Longer pipeline also means more expenditure. “There is enough water in the second tank for two crops, but now we are not able to get even one decent crop,” he says. The ambitious drinking water pipeline project has now been abandoned. If watershed development work is properly carried out and groundwater recharge is effective, water storage for irrigation is the byproduct, says M N Khadse of non-profit Dharamitra, which has played a key role in implementation of watershed programmes in Vidarbha. But government’s watershed programmes concentrate mostly on construction of water-harvesting structures. It is seen as an irrigation tool. “Government’s faulty approach creates false hopes and destroys people’s faith in the effectiveness of watershed work,” says Khadse, who is also member of Maharashtra State Water Conservation Advisory Council and Vidarbha Statutory Development Board. In absence of work many farmers take up watershed work under Mahatma Gandhi National Rural Employment Guarantee Scheme (MGNREGS). But most projects under the scheme do not get completed, says Vijay Anna Borade, former member of the state Water Conservation Advisory Council and engineer of the highly successful Kadwanchi watershed in Jalna district (see ‘What ails rural job scheme’). Instances of Hiware Bazar in Ahmednagar where people used the employment guarantee programme for water revival are rare (see https://www.downtoearth.org.in/node/4039). The Employment Guarantee Scheme has been in effect in Maharashtra since 1978. Work for water and soil conservation is being undertaken under it ever since. The severe drought this year has exposed the failure of the scheme in the state. The Mahatma Gandhi National Rural Employment Guarantee Scheme (MGNREGS), launched in 2006, has failed because its focus is on providing employment, says Vijay Anna Borade, former member of state Water Conservation Advisory Council. There is no emphasis on completion of work. “People look at the scheme as a wage earner. They take up jobs during lean time, but drop it when better jobs comes their way. There is no compulsion from either the implementing agency or the people to complete work,” says Borade. Data states the rate of asset creation has been poor (see table). Nitin Raut, state minister for employment guarantee scheme, admits that completion rate is poor but says job at the time of need is itself helpful. The number of people willing to work under MGNREGS has also dropped. According to officials of the department of rural development, during the 1972 statewide drought, 1.5 million people had worked under the employment guarantee scheme. In 2012, the number dropped to 0.25 million. This is because of low wages and delay in payments, says Borade. The approved wage of Rs 140 is much lower than the Rs 200-250 per day that labourers can earn elsewhere. The first concerted endeavour to involve people in decision-making was in 1989 through the Indo-German Watershed Development programme (IGWDP). The programme introduced innovative mechanisms to ensure sustained community participation and transparency. It was implemented entirely through non-profits in coordination with gram sabhas. A village watershed committee, selected by the gram sabha, was in-charge of implementation and control of funds. A fund was created for maintenance of structures. The programme was a success and in 1995, the government of India introduced guidelines for watershed development under the Drought Prone Area Programme (DRAP) on similar lines. Non-profits were roped in as implementing agencies under the supervision of District Rural Development Agencies (DRDAs). But the programme fizzled out because of DRDAs’ lack of experience with either watershed work or participatory approach. “Many people’s representatives, ministers among them, grabbed contracts by floating their own non-profits,” says Khadse. In 2003, the guidelines for Hariyali, a watershed project, replaced non-profits with panchayat samitis as the implementation agencies and village watershed committees with gram panchayats. Gram sabhas now had little say in watershed work. In 2008, the National Rainfed Area Authority again gave gram sabha the power to constitute village watershed committees and nominate or elect office-bearers. Village watershed committees got the power to sanction funds. However, the post of the committee’s secretary was a paid post. In 2009, the department of land resources launched Integrated Watershed Management Programme. It was welcomed for its integrated and participatory approach and its renewed emphasis on capacity building. However, an order by the Maharashtra government in September 2012 brought things to square one. It vested the post of village watershed committee with the village sarpanch. The order was challenged in the Nagpur and Aurangabad Benches of Bombay High Court. The Nagpur Bench has dismissed the petition, while the Aurangabad bench has stayed the decision. “Now, contractors are always competing to head village watershed committees and grab watershed contracts,” says Popatrao Pawar, water expert and sarpanch, Hiware Bazar. Deputy sarpanch Govardhan Bhosale of Vida village in Beed district says he was nominated as secretary of village watershed committee in 2012. In the same breath he says that the last gram sabha meeting was held in 2010. “We are constantly exhorted to make the watershed programme a success, but we do not know how to do it,” says Uttam Gaikwad, resident of Vida in Beed district. “Office-bearers of the village watershed committee ignore our demand for training,” he says. Because of lack of people’s participation in decision-making, a lot of work is duplicated. 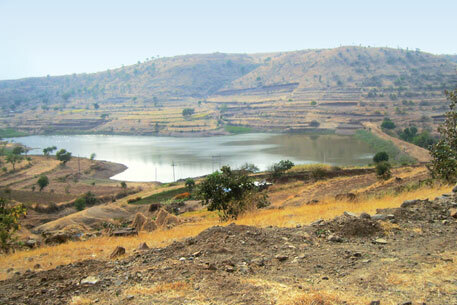 In Hastapokhari village in Jalna bunds constructed between 2004 and 2007 were removed by farmers due to waterlogging. But fresh bunds are being constructed under MGNREGS. 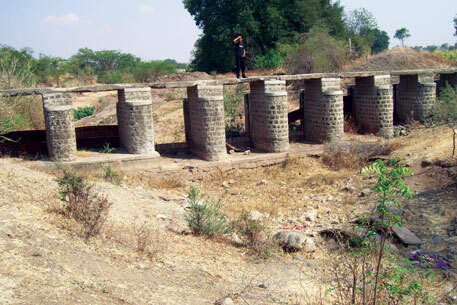 Five years ago in Ahmednagar’s Chicholi village, two new check dams worth Rs 10 lakh failed due to poor construction. Now, the government is constructing two check dams, says deputy sarpanch Rohidas Patil. “Unless farmers are taken into confidence and their knowledge taken into account, work turns out faulty and they get rid of it as soon as possible,” says watershed expert Dwarkanath Lohia of Beed-based non-profit Manavlok. “This apart, machines have been permitted under the plea that they speed up work. But they actually remove the community from the work scene and allow contractors and officials a free hand,” says Khadse. Without community consultation the bulk of watershed work carried out in the state is inferior, technically flawed, riddled with corruption and the number of incomplete work is high. Of the 1,609 projects undertaken since 1999 under Drought Prone Area Programme in Maharashtra, not one is complete despite 81 per cent of funds being released, data with the Department of Land Resources reveal. Under Integrated Watershed Management Programme, only two out of 84 projects have been completed since 1999 after 83 per cent release of funds. Andhra Pradesh, Tamil Nadu, Gujarat and Madhya Pradesh have fared much better on this front. Following complaints of shoddy work, in 2011 the divisional commissioner of Amravati set up a committee to evaluate watershed projects in the region. Fifty projects under various schemes in five districts were randomly selected. All but four projects were inferior and technically unsound. Costs were unrealistically escalated in all projects, while most were incomplete. The committee’s report, which had Khadse as a member, states that 90 per cent of the check dams and 80 per cent of farm ponds were at incorrect locations. Measurements of all bunds were faulty and compacting was not done. Drainage channels were not constructed though contractors were paid for it. Drainage channels ensure that bunds do not break or cause waterlogging when it rains. Significantly, despite orders from the divisional commissioner, the agriculture department has not produced any important project-related report, says Khadse. In Osmanabad, 960 Kolhapuri wiers were constructed. None is working. Residents of Antarwali village told Down To Earth that the wier fails to store water due to faulty location. “Mammoth amounts are spent on watershed development work, but the quantum of bad work has not been evaluated properly,” says Varade. “Government policy has never really recognised the importance of watershed work,” says Vishwambhar Chaudhari, Pune-based water activist. The stress is on surface irrigation from dams. Merely Rs 12,000 per ha is allocated for watershed development compared to Rs 3.5 lakh per ha for dam irrigation. “Even if water of all the dams in the state was used up, it would irrigate 27 per cent of the agricultural area,” he says. The allocation is not enough for proper completion of work, says Varade. This apart, flow of funds is irregular, which slows down work. Varade is among several watershed experts who have written to the government to hike fund to Rs 25,000 per ha. Diversion of the fund to purchase equipment that have nothing to do with watershed development worsens the situation. Residents of Vida got solar lamps, gym and library equipment from this fund. “Half of the solar lamps are now out of order. Other equipment are locked inside the deputy sarpanch’s house,” says Gaikwad. At Ambhi in Osmanabad, 200 cycle-mounted hoes are rusting with the panchayat. “Nobody needs them,” says Padmasinha Gatkal, head of village watershed committee. This year’s drought is, no doubt, man-made, caused by deliberate neglect and failure of the way we manage water and land. Within a few years, the Krishna and Godavari basins will have substantially less water owing to climate change. Most irrigation projects are incomplete. With rapid urbanisation, water demand will go up. Groundwater recharge is a must even as cities and industries need to become water prudent. But we are going all wrong in our strategies. We have made drought perpetual—rain or no rain, money or no money. "Drought of equity" brings out drought situation in Maharashtra in a comprehensive manner. It covers almost all aspects. It indicates the urgent need of an in- depth analysis of Maharashtra's water sector. Times have changed. But policies, laws & attitudes remain much the same. It is hoped that DTE will further pursue the matter.I am really worried about the drought situation in May 2013.Climax is yet to come. A very good article. Has exposed many of the key issues behind the drought in Maharashtra. The title is very good, highlight the major reason. As mentioned by the article, the irony is that Maharashtra is the state with maximum number of large dams in the count. This shows that such projects are not the solutions to meet the needs of water. Arid countries such as Israel are able to maintain high quality agricultural exports through simple measures such as drip irrigation. Other measures such as re-forestation, effective rain water harvesting, soil conservation, and minimizing contamination of existing water supplies will go a long way in ensuring adequate water for our growing population. Remember that thermal (coal) and nuclear power plants require huge amounts of water compared to wind and solar. Increasing solar installations - as is being done in Gujarat - will reduce our appetite for water hungry energy sources. Very good article, thank you for this. The drought will continue as summer begins, making water access even more difficult. One area of interest is the role of soft drink and packaged drinking water companies in these areas. Atul Singh, who is mentioned in the article, is not just the FICCI Water Mission man, he is also the CEO of Coca-Cola India. And it must be mentioned that Coca-Cola is the largest purchaser if sugar in India. There were calls to stop water usage by such companies in the Maharashtra legislature in January but they enjoy tremendous influence because they are very much tied to the sugar producers and also because they are American companies. Their water use should be stopped or severely restricted in order to ease the water scarcity in Marathawada. Water for people, farms and animals first, everything else must come after. I doubt Atul Singh would agree with that though. Integrated Watershed Development is the only solution. It is adapted by the Governmental Agencies, but there are two problems along. One, it is well known as it is chronicle . . . corruption ! Till date the money used to improve the water resources is countless. If someone gives me only 50% of what it is utilized till date in Maharashtra; i shall solve the water problem of whole India ! Forever ! Sustainably !!! Second, Scientific approach is not adapted while treating the watersheds. Geology is the most neglected field while the development of watershed. As a result, the storage reservoirs acts as percolation tanks, and, the funds utilised for percolation tanks appears to be not percolating down ! ;-)))))) . . . more than 40% is evaporated in corruption % rest goes off by surface evaporation ! This year (2013-14) Ujani dam is full to 111% . . . its really fun to see that in the name of Vitthal of Pandharpur, how the water turns up in to juicy sugarcane ! True warkari remains as juice sucked bugass ! There was generous campaign launched by the Akaluj lead. To harvest the opportunity of emptied/dry Ujani reservoir. Idea of removing silt from the reservoir was really EXCELLENT. It was lets say life time opportunity to increase the storage capacity of dam. The implementation of idea would have generated crores of revenue through selling the silt . . . but the problem of identity crisis killed it ! Adapted the idea, the credit would have gone to the particular person or political party who had suggested it! This is good example of an 'solution to the problem being politically victimised' . . . the solution is sunk at the bottom of highly polluted DEAD reservoir. . . . sometimes the politics puts people in really an awkward situation ! That means we have to WAIT for another DROUGHT (which nobody in fact) . . . to remove the silt.